Free on-site Parking steps away from the office. The Neurosurgical Institute of Florida is one of the premier providers of neurosurgical care in the region, and recognized as a center of excellence. Providing services to thousands of patients with hundreds of successful surgical procedures each year, the physicians and staff place special emphasis on offering the finest in patient care. We are uniquely equipped to handle routine cases and technically demanding cases. 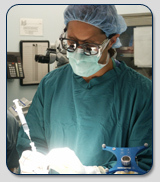 The Neurosurgical Institute of Florida is comprised of neurosurgeons who specialize in a variety of neurological areas including radiosurgery, neuro-oncology, pediatric neurosurgery, stereotactic procedures, skull base surgery, spinal instrumentation, spinal lesions, aneurysm repair, and others. We offer state-of-the-art technology for treating neurological disorders, including Cyberknife and Gamma Knife technology. Having treated hundreds of patients with this advanced approach to brain surgery, we are a leader in radiosurgical care in Florida. Peyton Manning and four cervical procedures, Dr. Mark Shaya comments. See Dr. Mark Shaya on WPLG discussing high blood pressure. Listen to Dr. Mark Shaya discuss neck and back pain on internet radio. "This book represents an inexpensive and very valuable tool for neurosurgeon education. It belongs on every neurosurgeon and neurosurgery trainee’s shelf."